I'm so pleased to present Beach Birds. This is a very traditional pattern called Birds in the Air. I am calling this Beach Birds because I made this while snowbirding at the beach in South Carolina. Notice the flying geese are in the "V" formation, getting ready to head north. This quilt will be heading north really soon too. It needs to be quilted and bound before our guilds quilt show at the end of April. This pattern is from BHG's American Patchwork & Quilting Magazine from February 2000. After the quilt show, this quilt will be Mitchell, my grandson's quilt. He picked out the pattern from my collection of quilt magazines. He loves the color blue. It's always been his favorite. And finally, he personally authorized every blue fabric that went into this quilt. Gail, that is stunning! I have watched it grow from blog to blog, but I had no idea what it would turn out like. It is so fun! Mitchell will love it! Good choice on all the fabrics Mitchell! Lucky Mitchell! And how fantastic that he was so involved & enthusiastic. Lovely quilt. Wow...that looks great! I showed Mitchell and he LOVES it! Can't wait to see it on his bed. Georgeous! If Mitchell doesn't want it I know someone who does! Oh Gail, it's gorgeous!! You know me- I love blues... Great choice Mitchell!! The results are stunning; I find it difficult to work with blue because it isn't my favourite colour but your results are worth moving out of my comfort zone. I have been thinking about a graduation quilt for my son, soon to be a pilot, and wanted to stay away from the obvious airplane block. 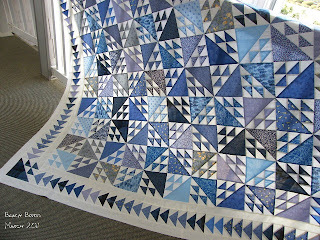 "Birds in the air" says it too and your quilt inspires me. Your grandson will love it. Gail - it's just gorgeous!! !